Facebook is redesigning its messaging app Messenger. Messenger has got horrendously bloated in recent years, as ever-more features are added to it, from face filters to games to Stories to bots. A simplified version is going to start rolling out in the coming weeks – and Facebook also has plans for a dark mode. Messenger is getting an fresh coat of paint. The Facebook-owned messaging app is being redesigned, the company announced on Tuesday, in an effort to cut down on the bloat and confusing user interface that has plagued the app in recent years. Since being spun out of the core Facebook app into its own product, Messenger has grown to more than 1.3 billion monthly users. But even its own execs have admitted it has been overstuffed with features across nine tabs, from games to Stories, and there has been a substantive redesign promised for more than a year. 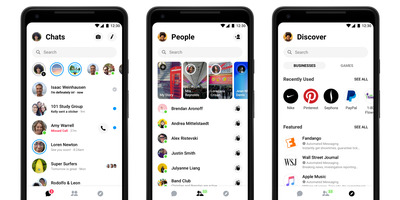 “We built a lot of capabilities over the years but as you can see it’s not as simple as the app was at the beginning of our journey,” Messenger boss Stan Chudnovsky said at a press conference in San Francisco. 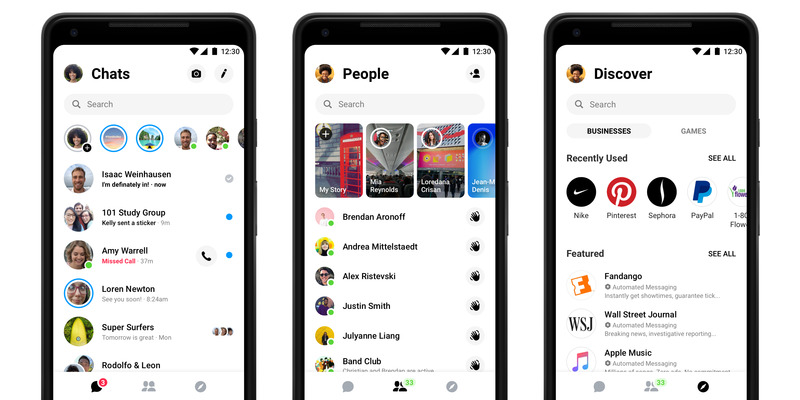 The redesign, which it first formally announced at the F8 conference earlier this year, rearranges Messenger’s features into three tabs, adds some more customisation features. It will roll out in the coming weeks for users – and Facebook plans to add a dark mode in the future too. There are now three key tabs: Chats, People, and Discover. Chats will hold users’ conversations with their Facebook friends, and also feature Stories; People will give more prominence to Stories and display friends who are currently active; and Discover will be home to users’ interactions with businesses and games on the app.